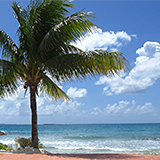 One of the first things we noticed when we first visited Anguilla was... no road signs. 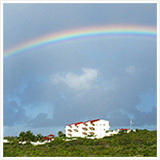 Everyone navigates by landmarks in Anguilla. "Take the main road until the first road after the second roundabout, go until the third church, and then take a right." Get the idea? Organized chaos. They are practical! You can tell where you're going far more easily. 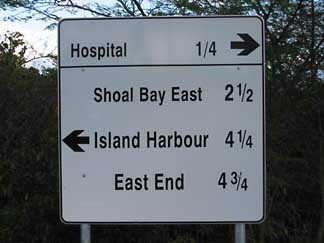 No more "Mimi Bay signs" on Anguilla. They not only give you the direction and name, they even give you the distance. Welcome to the third millennium! 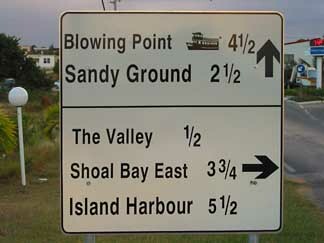 It will be much harder to get lost with these signs handy. But, I do sort of miss the "good/bad old days!" 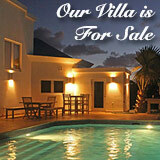 Oh well, you can't stand in the way of progress, not even in Anguilla. And first-time visitors will stop driving into the middle of ponds, I guess. So I guess it's all for the best.